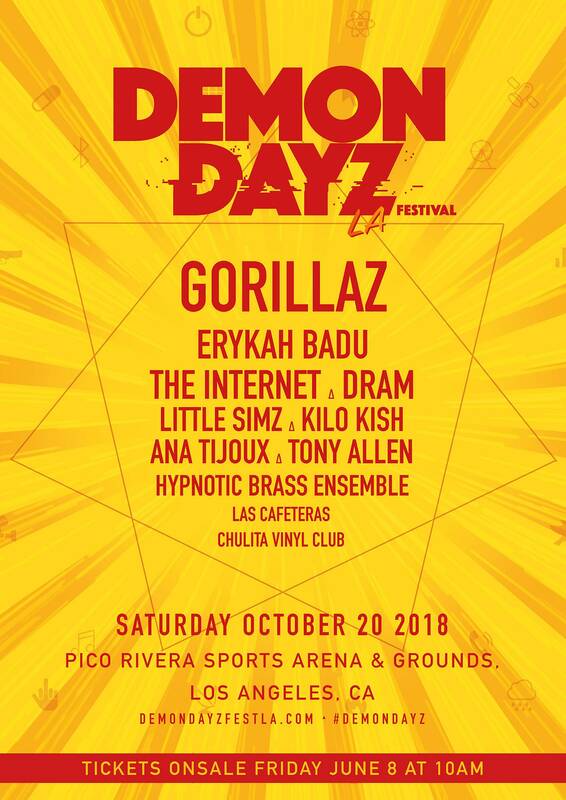 Gorillaz have announced the line-up for their second annual Demon Dayz Festival. Erykah Badu, the Internet, DRAM, Kilo Kish and Little Simz are among the acts that have been confirmed so far. Last year, the event was held at the Dreamland amusement park in Margate and featured De La Soul, Kano, Danny Brown and Vince Staples. This year, the bash will be held at the Pico Rivera Sports Arena & Grounds in Los Angeles on October 20. You can check out the full line up on the flyer below. Tickets go on sale this Friday (June 8). Last week, Gorillaz shared two tracks – ‘Humility’ and ‘Lake Zurich’ – from their new album, ‘The Now Now’. Despite Damon Albarn saying in 2017 that he wanted to “surprise release” the next Gorillaz album, it was recently confirmed that their next studio effort will be released on June 29. The band are playing are also set to appear at a number of festivals over the summer, including a headline slot at Poland’s Open’er. You can also see them at Roskilde, Lollapalooza Paris, Sziget, Sonar, Boomtown and Lowlands.